Well, it's officially hot here in Houston, and has been for quite some time now. With such a stifling climate, it's no surprise that our local brewers over at Saint Arnold brew up an immensely popular summer seasonal. Summer Pils, released back in 1997, was Saint Arnold's first ever lager. The recipe has varied a little over the years, with the final formulation settled upon in 2006. Tie-dye is featured prominently on the label, and has become somewhat of a calling card from the brewery, even showing up on their 1957 Bentley (which can be yours for the price of just 200,000 Saint Arnold six-pack holders). Crisp and refreshing, this beer is perfect for a hot summer day. 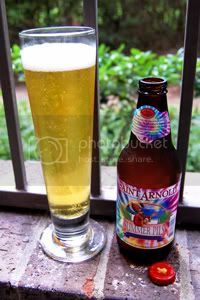 Saint Arnold Summer Pils has a delicate, sweet malt taste complemented by an abundant hop aroma and flavor. Well, it's not getting any cooler just sitting here, so let's crack a bottle and try to beat the heat. Appearance: A clear, pale straw body with a thin white head that disappears rapidly and leaves no lacing. Aroma: Classic Pils in the nose. Grassy, lemony noble hops over a pale, slightly grainy malt base. Taste: Up front, the same grassy, lemony noble hop profile found in the aroma. Saint Arnold claim 41 IBUs, but I never would have guessed that high. Underneath, the German Pils malt backbone provides a little body and sweetness, but ultimately knows its place. This really showcases the noble hops well. The aftertaste is grainy and lightly bitter. Mouthfeel: Medium bodied with crisp carbonation. Clean and dry finish. Drinkability: Excellent, as you'd expect from a Pilsener. Verdict: Saint Arnold have brewed up a great Summer seasonal for Texas. It's kind of a mix of the German and Czech Pilsener style, and the result is an tasty, highly drinkable hybrid.